With every import and deletion of lists within the CleverReach backend the system automatically creates a backup of the data. This enables you to have access to your core data at any point and recover lists if necessary. You will find this setting under [My Account] > [Settings] > [General]. 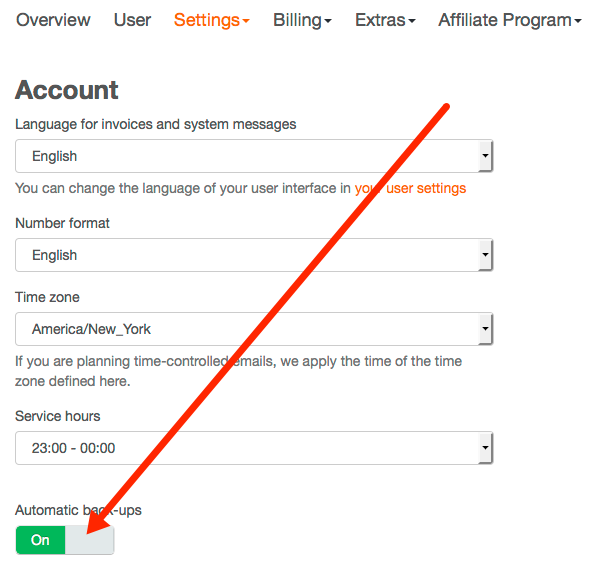 If the switch [Automatic back-ups] is active the data will automatically be stored as described above. These backups are available for 30 days until they are finally deleted. Backups are not created for integrations with external systems (e.g. xt:Commerce, Magento, Contao, API etc.). Via [My Account] > [Extras] > [Backup] you can access your backups. The backups are sorted by lists and date. When you click the download-symbol you will download a csv-file with the stored data. This file will contain all data that was available at the time the backup was made. If you would like to recover the data you can simply import them back into your account (find help on the import here). When you import a formerly deleted list from your backup be sure to include the information on opt-in and unsubscribe since otherwise you might activate formerly unsubscribed users. Additionally, you need to use the option [Update and Add] when importing a list from the backup. Recipient activity (opens, clicks etc.) is not included in the backup. Only the core data is saved (e.g. email, first name, last name). Settings for the backup function can be changed on a group level. Under [Settings] > [General] you can deactivate the backup for specific groups. Keep in mind that the backup functionality can slow down the regular import of data. If an import / deletion is performed via an external interfact (e.g. API) no backup will be created. When using external interfaces (e.g. xt:Commerce, Magento, Contao, API etc) no backup will be created.